Nineteen Effie trophies were awarded at Effie Germany’s 32nd annual awards ceremony held this year on November 14th at the Social House Palm Garden in Frankfurt. Two gold, seven silver, and ten bronze Effies were awarded across eleven categories by a jury of senior executives from advertisers, business, agencies, media and market research. Winners are distinguished by effectiveness and proven success in the market and the awards are recognized as the premier award in the marketing community. Gold Effie Awards were presented to client/agency team Schwäbisch Hall/Ogilvy Deutschland for the "Most Important Place in the World" campaign and to ŠKODA AUTO Germany/Leagas Delaney Hamburg for the "To go SKODA" case. Other top winners include: DB Mobility Logistic/Ogilvy Germany, Deutsche Telekom/DDB Tribal Group, DEUTSCHLAND RUNDET AUF/Dorland Werbeagentur, mobile.international/VCCP, Nikon Deutschland/Jung von Matt, Toyota Deutschland/Saatchi & Saatchi Düsseldorf/Zenitmedia/KPP Event/HAGEN INVENT, and Unilver Deutschland/Ogilvy Desutschland/Mindshare. The evening included celebrity guests Christoph Metzelder and Markus Frank, Economic Affairs Officer of the City of Frankfurt and host Judith Rakers. 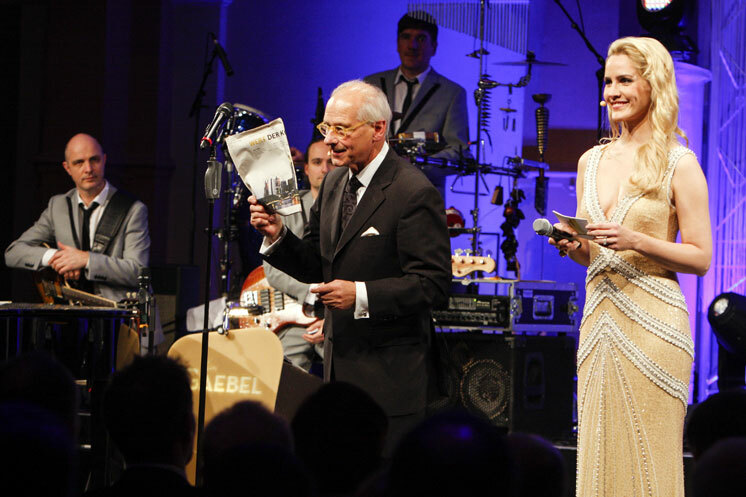 German singer Tom Gaebel and his orchestra, provided a swing themed musical background for the evening. The event was organized by Effie Worldwide's partner GWA, the German Association of Communications Agencies. Effie Germany, launched in 1981, has recognized effective marketing communications for over 30 years and is the oldest Effie program after North America.